Last night we began a bit of holiday decorating. One of the first things to go up – are the stockings!!! Under the mantle, we hang the stockings for the girls and Peter and I. Cait’s is a tiny little thing, with an itty bitty teddy bear tucked into a pocket. 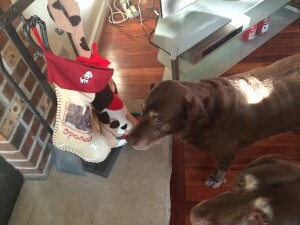 It was her very 1st stocking, purchased on the day we took her to see Santa when she was a month old. Erin’s is a bigger one (shocking) that her grandmother gave her, when she was a little girl, the year we moved into the townhouse in East Brunswick (our first home after my divorce from their father.) Peter and I use stockings that I made the year I re-discovered sewing — and went crazy making halloween costumes, the tree skirt, and 4 stockings. LOL — I should not have used ALL of my excitement in ONE year! All that said, what brought me happiness this morning were the puppies!! 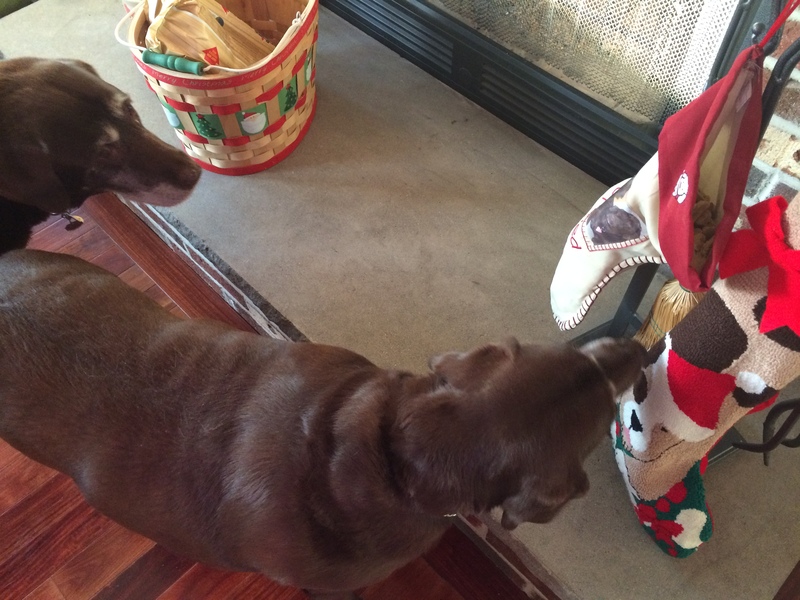 Their stockings are hung from the fireplace tool rack. One shows a cute puppy wearing a santa hat. The other has a pocket where we inserted their picture from years ago — with a simple caption which reads “Spoiled”. Yes!!! — just as they should be!